Loving the crockery and glassware! 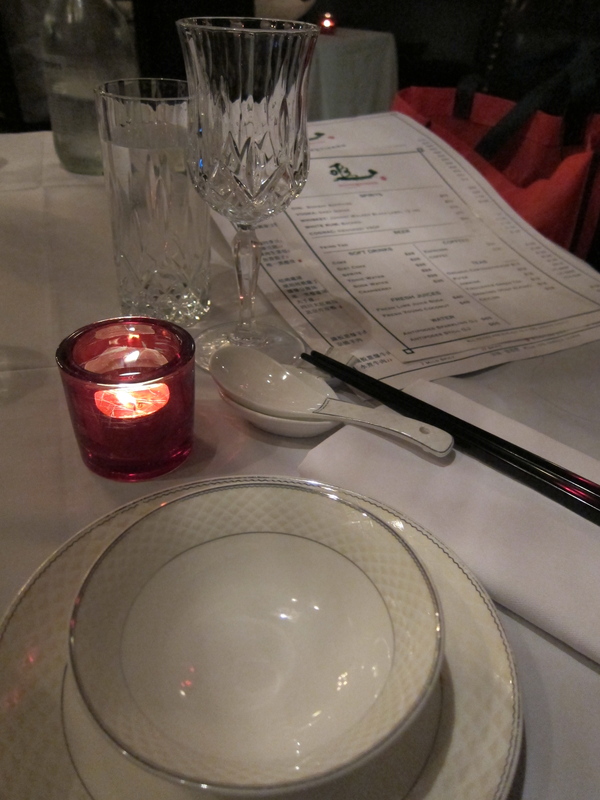 And it’s true, not all Chinese restaurants can be said to pay attention to mood lighting! 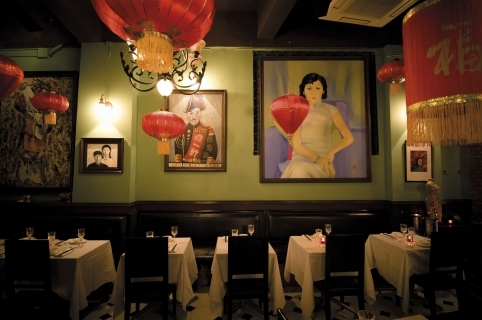 But this place is different – I quite like the colourful walls, the large pieces of commissioned Chinese art, the red lanterns, the soft and romantic lighting. And what better place to take a date to a place with the word “monogamous” in it’s name! 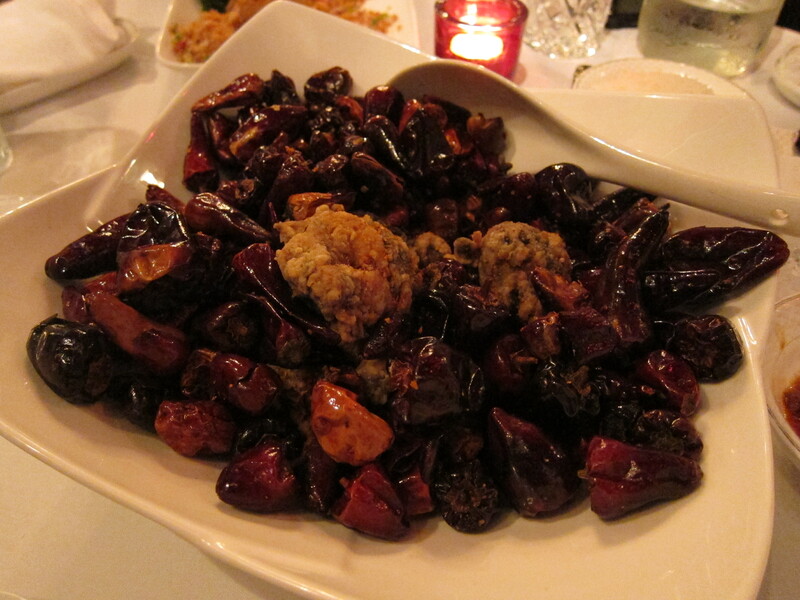 Goodness knows why they chose to call it “The Monogamous Chinese” but I’ve heard that it’s because they want to remain true to Sichuan and Peking dishes – which I was particularly looking forward to, as the cuisine always reminds me of my good ol’ student days in Beijing. 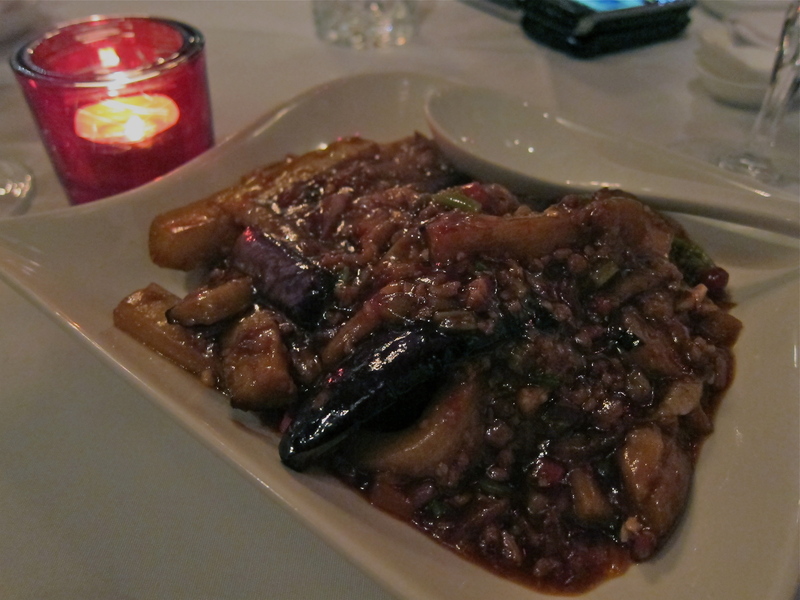 Our favorite of the evening – Braised aubergine and minced pork in a hot and spicy sauce (HK$ 128) flavorful and not too oily, the aubergine was perfectly cooked. 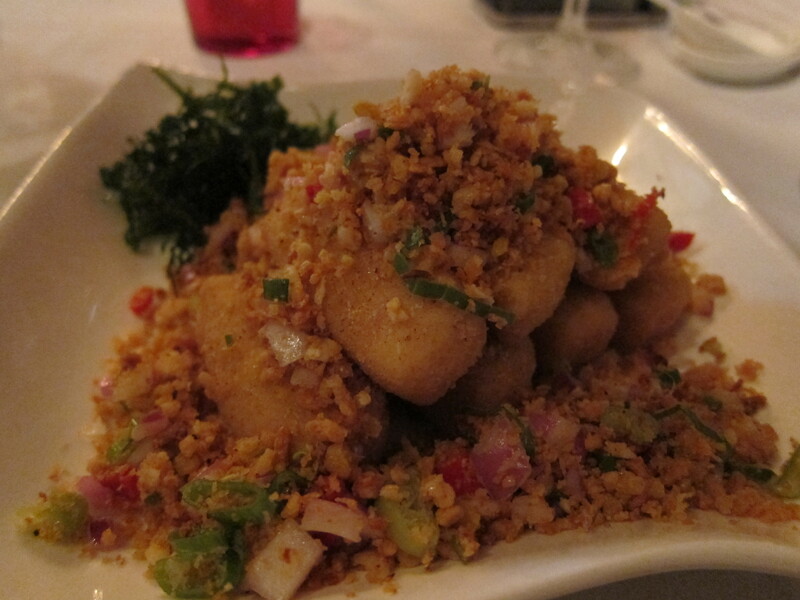 Deep-fried Tofu with Spicy Salt and Crispy Garlic (HK$ 98) – silken tofu wrapped in a wonderful crispy batter. Although tasty, the salt level was a bit too overwhelming after the first couple of bites. When we mentioned this to the manager, he looked a bit offended! “It’s supposed to be salty!” Hmm…yes, but does it have to be that salty? 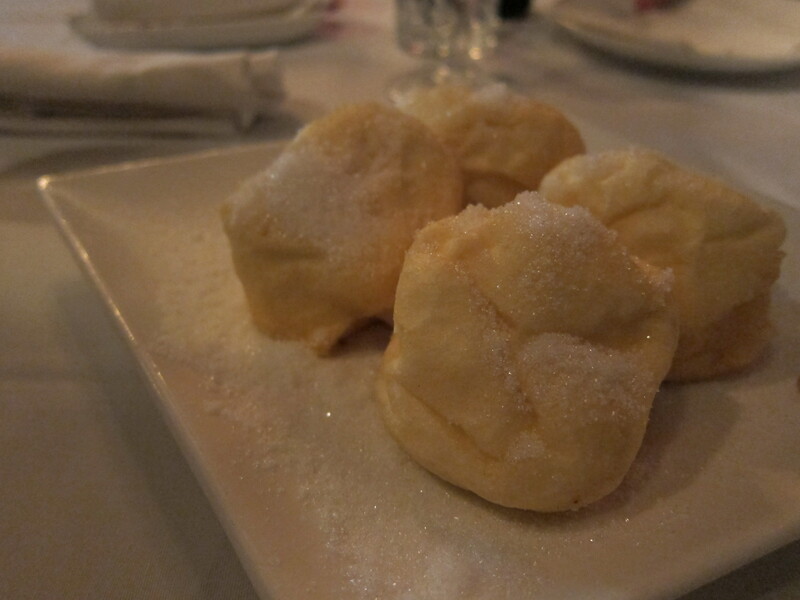 Deep-Fried Soufflé balls (HK$ 88) – this delectable puff ball was a nice way to end the meal. With a distinct egg-white taste, I was was hoping for an ice-cream filling rather than more of a cream filling. The ambience makes it a really cool place to have a more leisurely dinner than most Chinese establishments, and you can tell that great care has been taken to ensure that every detail is just-so. 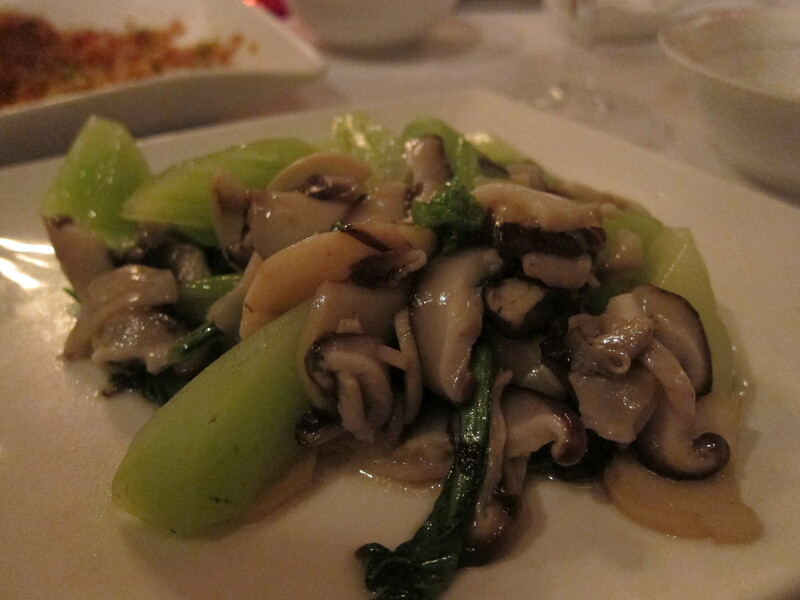 The selection gives you a lot to choose from, and there are a number of vegetarian options. Dishes are not oily and don’t have you leaving like you have to drink a gallon of water. There are 3 choices each of red and white wine – we opted for the pinot grigio, which for me worked quite well. I would definitely revisit this place to try other dishes with a larger group of friends, and especially want to try the Peking Duck! The restaurant is located below the Mid-Levels escalator, between Elgin Rd. and Caine Rd. Walk up the steps from Elgin and it is tucked away in a little side alley. There are some nice little tables in an alcove outside if you fancy some al fresco dining, although proceed with caution – when we were outside for a cheeky ciggie, I could have sworn I saw a rat the size of a ferret lurking under one of the tables! I remember Kehinde brought me here YEARS ago…. Is it still around? ?